South Africa is a motorcycling nirvana—especially for dual-sport riders. From the winelands in the Western Cape, all the way across to the Midlands in KwaZulu Natal, great riding and idyllic scenery abound. Commuting in Johannesburg is a far cry from traversing the countryside though. Jozi has it all: congestion, potholes, traffic lights that don’t always work and lawless minibus taxis. 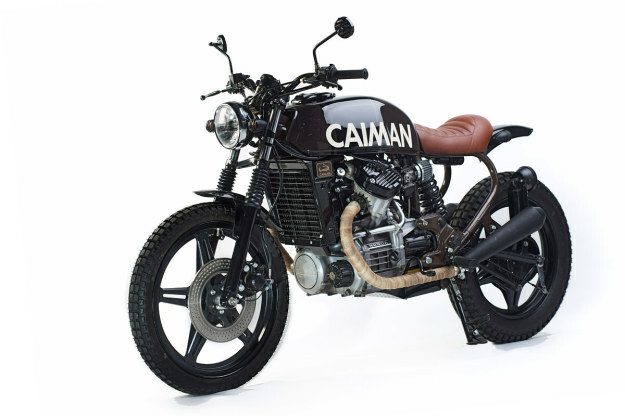 Caiman’s latest release is this Honda CX500 scrambler. Robust and purpose-built, it sums up the Randburg shop’s blunt aesthetic. 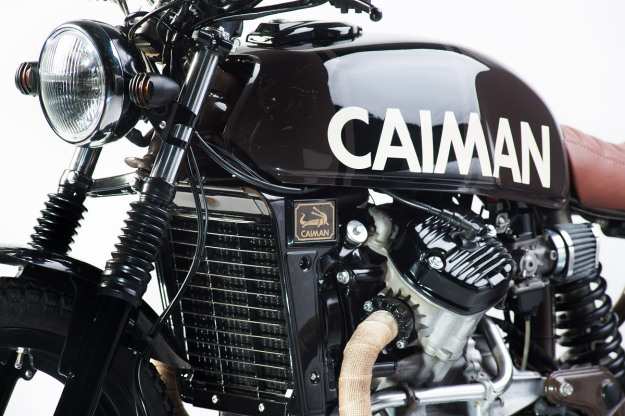 Gone are the CX500’s twin rear shocks. They’ve been replaced by a mono conversion, using a Yamaha YZ250 shock with an upgraded spring. The front suspension has been left alone, but treated to a new set of fork gaiters to help keep muck out. The subframe is now shorter and supports a custom solo perch. 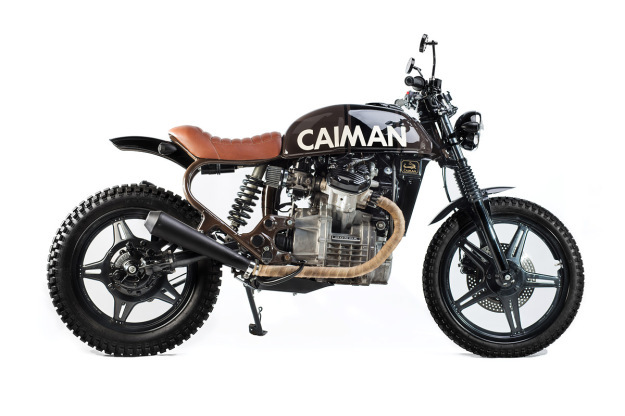 To clean up the area under the seat, Caiman ditched the airbox and tidied up the wiring. Everything runs on a smaller battery now—hidden away behind a hand-made skid plate. A pair of blacked-out reverse cone mufflers has been installed too. 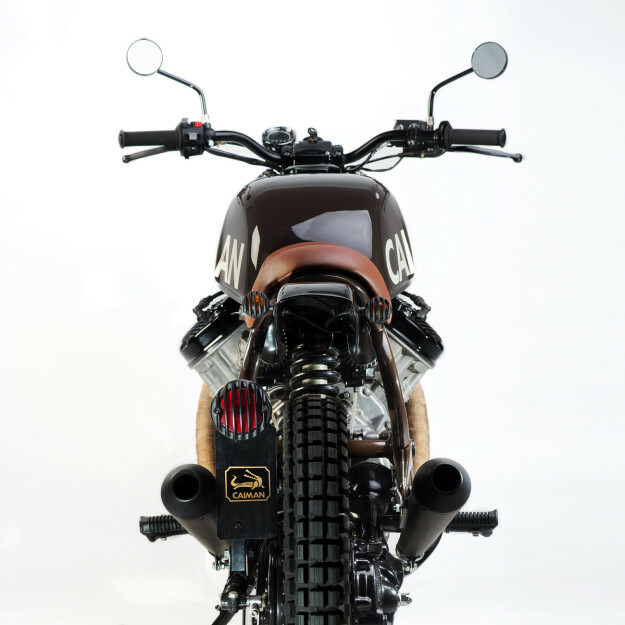 Up front are a set of tracker bars, an Acewell speedo and a smaller headlight. The turn signals and side-mounted tail light are a style that we’re used to seeing on cruisers, but they suit the CX500 well. 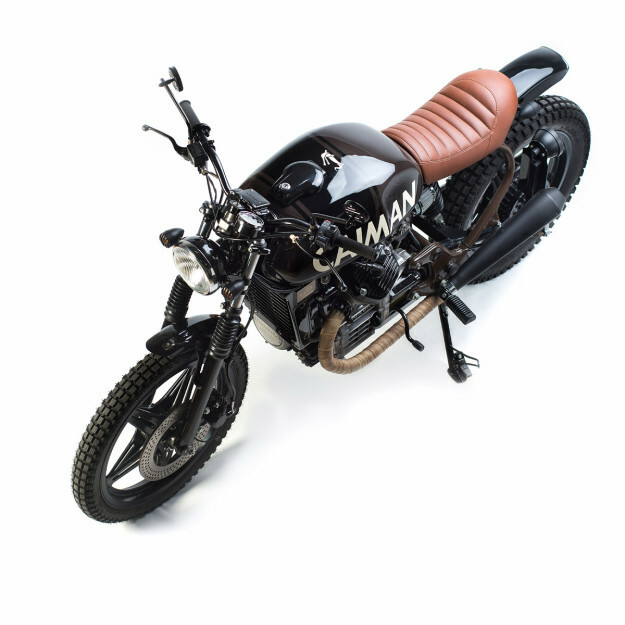 For paint, Caiman coated the frame brown and treated the tank to a subtle two-tone paint scheme. The wheels were powder coated black—along with a select few other parts—but the engine cases were left raw to maintain character. 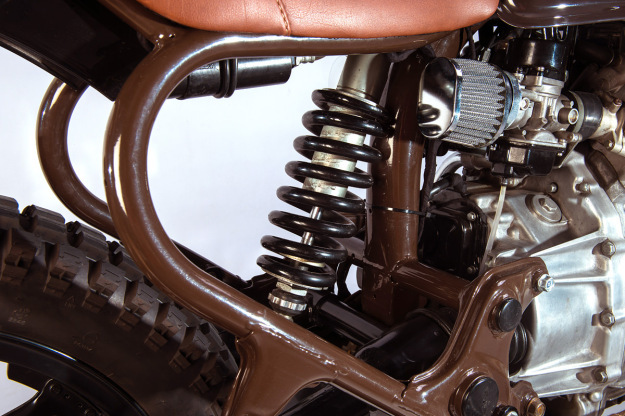 Knobbly tires from Kenda were fitted for both their visual and practical appeal. “Thick knobbly tires and longer travel suspension make riding a lot easier in Joburg,” explains Walter. Follow Caiman on Facebook | Photos by Louis van Zyl.